The 2013 Infiniti JX 35 Review: In the early 1960's, musical comedian Allan Sherman took the Jewish song "Hava Nagila" and parodied it as "Harvey and Sheila." Once Sherman got underway, he started including a long list of acronyms, like "Harvey's a CPA, he works for IBM" In the musical Hair there's the song, Initials (L.B.J. ), which starts out, "LBJ took the IRT". Acronyms abound today, and with the Infiniti JX, they are omnipresent. The JX boasts a long list of safety and convenience features, all acronyms, that make this one of the most high-tech rides I've ever had. Where to begin? Here is the list …..
Let's start with BCI, Backup Collision Intervention. It can tell if a vehicle is approaching from either side as you're backing up. If a car appears to be entering your path, it gives you three layers of warning - a light, a sound and, if you don't do anything, through the pedal itself. It can apply brake pressure if you don't take action right away. The Around View Monitor (AVM), with Moving Object Detection (MOD), shows you a 360 degree bird’s eye view around the car. Along with the BCI, this electronic nanny could be a lifesaver, but it also assumes that drivers aren't bothering to look around them. The list continues. The Lane Departure Warning (LDW) system, with the even more overt Lane Departure Prevention (LDP) system, uses a camera behind the front mirror that monitors the lines in the road to see if you're keeping near the center of your lane. If you don't respond to the warning light or buzzer, the system exerts braking on the opposite side of the car to help pull it away from danger. The Blind Spot Warning (BSW) system flashes a light if there's someone in your blind spot along the side, and makes a noise if you put on the turn signal. It can help straighten you out if necessary with braking inputs. The JX holds seven passengers in comfort, and offers an interesting new design language. It's nice looking, but does have a large, chrome fish mouth much like its FX and EX siblings, and the rear corner window pillar features what they're calling a "crescent" shape, that’s more like a jiggle. You may recall that Infiniti's first car, the Q45, was a large sedan with no grille at all, just a Samurai belt buckle on the nose, and it was introduced with a head-scratching campaign that didn't even show the car, just trees and rocks. The JX is reasonably powerful, with a 3.5-liter V6 engine pumping out 265-horsepower and 248 lb.-ft. of torque to move its 4,419 pounds. Fuel economy, per the EPA, is 18 mpg City, 23 mpg Highway (with an average of 20 mpg). I got 18.7. Green Vehicle Guide numbers are 6 for the Smog score and 4 for Greenhouse Gas. The only gearbox is a continuously variable transmission, which comes with either two or all-wheel drive. My Black Obsidian tester sent power to all four wheels. Inside, on the console, you can use the Infiniti Drive Mode selector to choose from Standard, Sport, Snow and Eco modes. These settings alter many things, including throttle response and transmission behavior, so you can customize the driving experience to your liking. The three-row seating is especially flexible with a sliding middle row, which you can move up to 5.5 inches forward or backward to supply more legroom in the second row or maximize cargo capacity. This is one luxurious vehicle, and my tester had four extra packages on it. The Technology Package included some of the high tech goodies mentioned above, and also a heated steering wheel and remote start. This feature lets you start the car without being in it. Why do that? Well, on a hot day you can get it cooled off before stepping in; on a cold day, vice versa. The Theater Package provides dual seven-inch monitors in the backs of the rear seats with wireless headphones to entertain your passengers. The Deluxe Touring Package upgrades to 20-inch alloy wheels and a potent Bose Cabin Surround sound system. A panoramic sunroof bathes second and third row passengers in natural light. Rain sensing windshield wipers work only as needed. Climate-controlled front seats heat and cool too. The Premium Package serves up the Infiniti Connection with a navigation system. With voice recognition, you can request things like the Zagat restaurant guide information, and traffic reports along with directions. Infiniti Connection gives you electronic access in an emergency too, much like the well-known OnStar system. 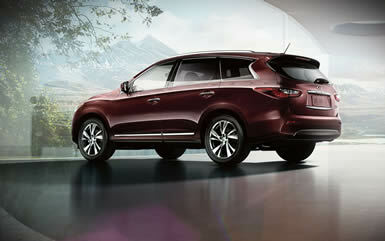 The Bottom Line: The 2013 JX 35 is a High Tech Crossover from Infiniti. This is a 3 row seating vehicle that can be equipped with all wheel drive and several technology based options that make it one of the smartest cars on the road today. It can see, sense and respond to traffic and road conditions faster that you can. It’s engineered to be a better back seat driver that knows when a problem may be ahead, on either side of the car, or even behind you. This type of technology is now available in several vehicles right now, and even thought it’s not cheap, it’s amazing what it can “see” and “do” to make a drive to the corner market much safer. These options, and more on the way, should be, and will be, standard in the years to come, on all vehicles. Or, you can own the future right now in a new Infiniti JX 35, so you should “Drive one, Buy one, Today ©”.